Experience NUA – just in audio! Then we started listening to the sound the doors of the media lab made, the whoosh of air and change in sound quality was what Andy and I wanted to capture, but it proved more difficult than we thought, wind noise when it closed and it not making the sound we were after, or not recording when it did make the right sound. All of us found ourselves pressing record to stop again, and that only produced a marker on the Zoom H4 that Richard had given us to use. We then saw that time was short and we had probably (definitely) spent too much time opening and closing the electronic Media Lab doors, so we moved on, recording footsteps through the gravel and then under the arch… As we went through the arch I really liked the echo, but none of us was wearing hard bottom shoes to record lovely ‘clippy cloppy’ echoey footsteps, and although we waited a little while, no-one passed through either. We then moved into the street and Alice caught a lovely bit of chatter from a large group going past, as the area between the two Art College buildings has a nice resonance when people walk past in groups, was one of the things we had written on our ‘would like to aurally record’ list. We moved into the the opposite building and recorded the giant metal door, with Iain making it sound very much like the noise it would make when rolled down. Looking into the 3D studios we heard some sawing wood so captured a small amount of that before we left, and again more great squeaky doors which soaked up our precious time. We had the NUA bar on our list to get a coffee being made but for some reasons – I can’t remember why now – we went instead to the cafe down the road and sampled Iain ordering a coffee (and a kitkat). Back to college and the hallways and textiles room was next on the list, with time running out rapidly we got the power washer, some running footsteps and walking noises, then had to return, as we were late. I knew that I wanted some extra sounds (and that library door), so went in the next day to capture a few vital sounds, that I felt were integral to my experience of NUA, things we hadn’t thought about on the previous day, on my little Zoom H1. 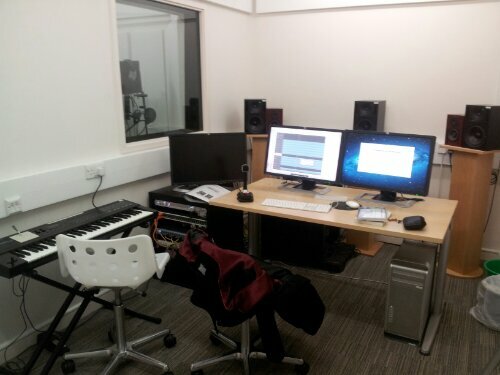 Then spent today in the sound studio (at City College) putting them together. I know Richard won’t thank me for sampling an outtake of his voice, but as he said himself… it needs an introduction. So alongside the happy sound experiment I am trying to get a stock of ambiguous footage, that could be used in the final project as a backdrop to the two different soundscapes, so after having a go at the ‘happy’ sound design I have quickly edited this close up footage of my daughter with the first test, just to see what does and doesn’t work well, with a view on the future finished piece..
My ears are constantly on the quest for is that a happy sound, what makes it so… and quickly writing down what it is. I’m never going to listen to anything the same again.